When I was in senior in college, I grew tomato plants illegally from our dorm roof by climbing out the window to step to a small row of potted cherry tomatoes just out of sight. A few months later, I graduated and moved the tomatoes to my first apartment’s tiny balcony space. However, now the tomatoes were clearly in sight and the hodgepodge of plastic pots just werenâ€™t cutting it. I headed to the nursery for a plant and pot upgrade. I must have spent an awful amount of time deliberating over terra cotta. At some point, an observant sales person introduced herself and asked about my project. I said I wanted my balcony garden to look better. Expecting to be upsold to a premium glazed terra cotta, she instead said that my current approach was entirely wrong – my dozen pots were too small for the balcony. Instead, I should invest in one or two big, big pots. Then, I should focus on contrasting textures and colors such as pairing the pointy leaves of a yucca tree with a tall and round ceramic pot and spiky grasses. The nursery assistant I met that day probably had decades and decades of container and landscape gardening experience and it showed in her clear-cut visual language. Since then, I’ve been surprised at how hard it is to find any resources that outline logical, systematic approaches for design evaluation — whether it’s in the garden, in art, or online. 2,500 years ago, Greek politicians created systematic communication techniques such as style, memorability, and delivery to convey their message, get loyalty, and win votes. However, communication is not just limited to writing and speaking. Today’s florists, set designers, and visual merchandisers know that arrangements are not just about aesthetics, they are also communicating information through cultural references and symbolism (e.g. wilted flowers and rotting fruit convey deterioration, alcohol and desserts mean sensual indulgence). However, while communication has been a field of study for thousands and thousands of years, object arrangement remains a largely intuitive and untaught discipline today. 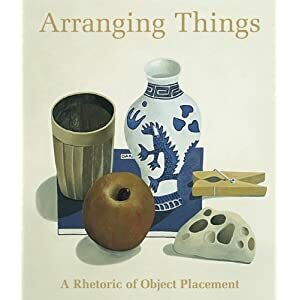 Koren suggests that if arranging objects is tied to communication, then we should be able to leverage the previous knowledge and apply a tried-and-true rhetoric to object arrangement today. Even if you aren’t entirely sold on the premise of object composition as a strong form of communication, the collection of still-life compositions is really amazing. I’m guessing that Koren spent years and years collecting the example compositions for the remaining two-thirds of his book. Each painted composition has a one-page analysis where Koren practices what he preaches — specifically dissecting each the object arrangement into eight dimensions such as metaphor, alignment, coherence, and hierarchy. I recognize that this isn’t going to be a best-seller book any time soon, it’s not even fantastic bedside reading material. However, it is definitely one of my favorite resources on my design bookshelf and I think it is worth sharing, especially if you are working with a team of designers on a day-to-day basis. A combination of the New Years and bloggers with more holiday free time means one thing: an onslaught of top ten lists. And with this year rounding out the end end of a decade (I’m ignoring the 2009/2010 decade end debate for a second), the top ten lists have been especially prevalent. Your feed reader has probably been glowing with top ten goodness. However, what I consider to be the best end-of-year list is: 1) most likely something you’ve never encountered and 2) potentially at risk of extinction in 2010. Better than top ten best/worst movies, top ten tech trends, or even top ten divorce settlements… I’d like to introduce the Durango, Colorado (population 13,922) end-of-year police blotter report. Unlike most larger-than-life, world-record-breaking, best-of top ten lists, the Durango Herald blotter round-up is full of slow-town, we-are-what-we-are charm. This is a Southwest town that entertains itself with winter belt sand races and where four-wheel drive Subarus may well enjoy the highest resale value in the country. The Durango Herald publishes the police blotter each day and at the end of the year, they consolidate the entire list into their most noteworthy blotter events. According to my father who lives in Durango, this may be the final year of this annual tradition. He has informed me of a recent feud triggered by police deparment budget cuts between the Durango Police Department and the Durango Herald. The police department is no longer feeding daily reports to the Herald. To many in Durango, the blotter report is the highlight of the Durango Herald and with subscriptions at risk, the Herald has a lot at stake and is leading a protest. Jan. 5 6:47 p.m., A man and a woman were involved in an argument and an underwear-throwing contest in the lower 100 block of Pine Lane. Jan. 7 5:23 a.m. A woman called 911 to report her television fell off a cabinet, and she needed someone to pick it up for her in the 800 block of Goeglein Gulch Road. Feb. 15 5:58 p.m. A woman called 911 to request a priest to perform an exorcism on County Road 240. March 13 3:47 p.m. A man reported finding a â€œliving roomâ€ in his Dumpster in the 600 block of East Eighth Avenue. March 29 11:36 a.m. A man in a city park was attempting to light a campfire in the 2900 block of East Third Avenue. Officers determined he was practicing his survival skills. July 15 1:19 a.m. There was intermittent yelling in the 2500 block of Delwood Avenue. Police found people playing Yahtzee. They were asked to keep it down. Aug. 22 7:04 a.m. A man had been sitting on a bench since 5:30 a.m. in the 200 block of East Park Avenue. Police responded and learned the man was doing tai chi. Sept. 4 6:51 p.m. A man was pacing and sweating and acting strangely near the 200 block of Woodcrest Drive in Durango West I. He was wearing black pants and a black vest. A deputy responded and learned the man had been jogging and was wearing a weight vest. You can voice your support in the Durango Herald article comments section. Or, more likely, you can just take a moment to enjoy a glimpse into a town with a slower pace of life and a good sense of humor.